Optimistic replication of data is becoming increasingly popular in distributed systems. However, the performance characteristics of such systems are poorly understood. We have developed a generalized simulation framework to investigate the operating costs and service quality of optimistic replication for file systems. We describe the simulation and present the results of a validated, trace-based simulation study of an optimistic replicated file system. The simulation can support a large-scale, heterogeneous, distributed environment specified by its own input language. The abstraction of library components allows the extension of our simulator to match a variety of system settings. The input traffic emulates actual trace data collected at a representative office-computing environment. 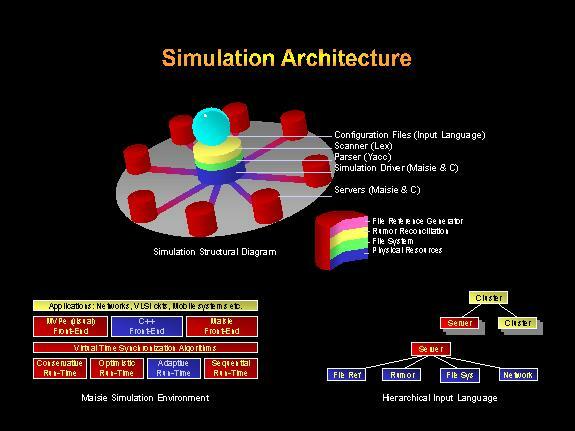 The simulator is developed using Maisie, a C-based discrete-event simulation language, which enables parallel execution of the simulation. Our simulation revealed that the widely used conflict rate metric is misleading: If you never exchange updates, you will never have a conflict. We investigated this anomaly and proposed alternative metrics to evaluate the service quality of optimistic replication. In addition, the deduced operational costs from simulation suggest that we can economically achieve a high quality of optimistic replication service. We demonstrated also that optimistic replication scales well, and the low percentage of active users in a large distributed system self-regulates service quality. Finally, we discovered the interdependence of frequency, method, and path of data propagation, on the operating costs and service quality of optimistically replicated file systems.